The form in Anishnaabe Art is an outline that is penetrated to the view of the spirit that is invisible. This reveals the essential core of meaning, conveyed in a symbolism that is ancient. In 1962, the Anishnaabe - Ojibwa artist Norval Morriseau broke the ancient taboo of his culture and revealed these symbols outside of this tradition. In doing this, he communicated to the modern world and inspired the next generation of Anishnaabe artist to reveal meaning in these symbols. The strong spirituality of this meaning too root in the scared island of Manitoulin, the largest freshwater island in Lake Huron. The Great Lakes Water Basin washes through the limestone rocks of Manitoulin which provides a natural water filter to the lakes. Voyageurs regularly interacted with the tribal nations surrounding the Lakes and the Anishinaabe were aware of European Culture long before European settlement had reached them. When disease was introduced, Manitoulin was burned and left fallow for several decades to cleanse it from diseases. Manitoulin became the strong-hold and home for the Anishnaabe when forced removal and relocation of tribal nations became Federal Policy in the United States in the 1800's. In the war of 1812, when the United States planned to invade Canada and sparse British forces were spread out across the Canadian border, it was the Ojibwe who gathered and stopped the Americans. The Ojibwe decided that United States policies had reached far enough. The island of Manitoulin which lies within present day Canada, remains sacred. Its sites, culture and traditions continue and are communicated by Anishnaabe artists within a traditional discipline of knowledge. When a painting of Morriseau's was delivered to the outside painter of abstract modern symbolism, Pablo Picasso's works were " well, you never know." The sophistication and dept of Morriseau's work was an unexplained revelation. Modern Anishnaabe artists, especially in Manitoulin communicate a perception and knowledge that transcends science and culture as we commonly understand it. The European roots of modern abstraction finds itself at a loss for comprehension when the vastly dynamic realm of meaning is revealed in Anishnnabe painting. Sublime simplicity is relegated to primitivism, but Anishinaabe symbolism is no more primitive that the simplicity of E=mc2. The frontiers of modern science has just begun to glimpse the universe in ways in which the Anishnaabe perceive and are familiar with it. 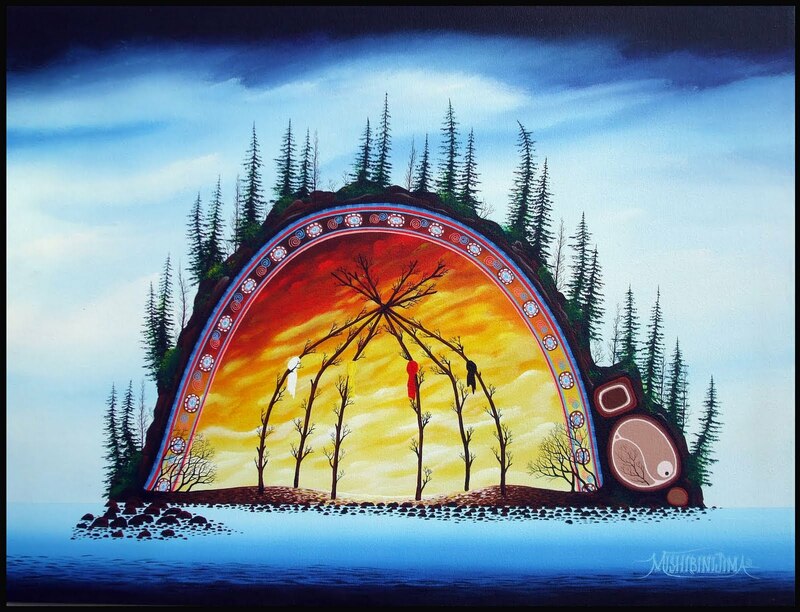 An intelligence found to exist outside the human skull that communicates in a reciprocal relationship with human beings in the natural territory of Anishinaabe painters. The Quantum realm that is influenced but not controlled by human intervention is the natural science of Anishnaabe tradition. Morriseau's first exhibition in Toronto in 1962 sold out, even though it's organizers and buyers did not know the meaning of his symbols. 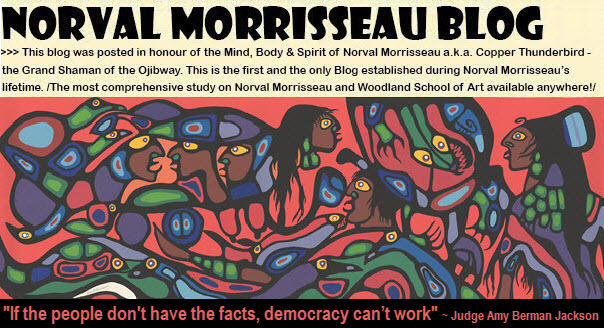 Morriseau touched the modern consciousness in a language of symbolism that predates Christianity by thousands of years. Modern Anishnaabe painters sell their work internationally in major art collections and continue to communicate a consciousness that is elusive and penetrating. Morriseau's work was held as a fine example of primitive art even in Morriseau's obituary in 2007, and even as the symbolism resonates within us without us knowing why. The generation of modern Anishnaabe artist who have matured in the traditions of ancient meaning stand ready to share this meaning. They reveal the earth's response to the industrial era. They communicate the spiritual response to the modern human dilemma. They are able to orient us to an invisible life force, within the gravitational pull and electro-magnetic wave movement of a rotating planet earth that orbits the sun elliptically. Their ancient perception and their symbols of meaning are ready to guide the shift in human consciousness that is occurring as we enter the twenty-first century. The knowledge distilled over millennia's has cleansed itself of excess baggage. It is the ZEN of living on the earth. It is an awareness we can barely conceive of. It's meaning is revealed to the modern world as modern systems begin to collapse in the face of ecological unsustainability. In the twenty-first century we are faced with the opportunity to expand human consciousness through the knowledge revealed in the powerful communicating tool of the ancient spiritual knowledge of the Anishnaabe which is painting, there is a native prophesy. - The Four Nations on Earth. * The painting in this post: "Bay of the Brown Beaver" /Mountain Series Art Collection/, Acrylic on Canvas, 24"x32", © 1985 James A. Simon MISHIBINIJIMA - Currently auctioned at http://mahdezewin.blogspot.com/.